The city of Malaga Spain with its approximately 550 000 habitants the second largest city of Andalusia, lies about 370 km to the south of Alicante along the Costa del Sol. 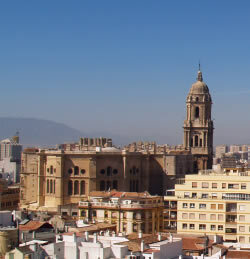 Most travelers use Malaga to get to their one of the many fabulous downtown Malaga hotels or apartment around the Costa del Sol. 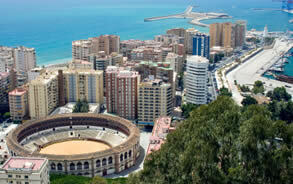 Malaga is capital of the province and with its lovely Harbor worth a visit. Famous for the pasas (raisins), Malaga is also well known for its superb wines. 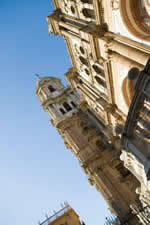 Malaga’s cathedral at the plaza de la cathedral, is one of the most prominent buildings of the city. The construction of the limestone building had been started in 1528 by Pedro Lopez and Diego Siloe. Built on the place of a Malaga mosque, construction had been interrupted various times and finally stopped in 1783 due to lack of money. The southern tower of the church is still not completed and therefore in spanish called la manquita, which means the missing. Old part of town lies west of the cathedral. With a good map you will find within all these tiny streets and footpath the market area. Worth a visit for any tourist, the market hall with its impressive marble entrance door, displays some of what the city has to offer. The look of tons of fish and the beauty of flowers, vegetables and seafood. Outside the market hall, you will find many nice bars and restaurants. Just right for a little break. One of the most famous sons of the city is Pablo Picasso. You still find his birth house at the Plaza de la Merced 15. The building is home to the Foundation Picasso. The larger and more famous Picasso museum can be found at the Palacio de Buenavista at Calle San Augustin. Certainly worth a visit for anybody interested in Malaga’s most famous artist. A little bit further north in the Calle de la Victoria, you will find the lovely church nuestra senora de la victoria from the 15th century. One of the nicest areas is the Harbor Particularly with a lovely park alongside, it allows you to relax from the sometimes so busy city. The paseo dl Parque pathway leads you from the plaza de marina to the bullfighting arena. It lies just on the feet of the impressive castle de Alcazaba, which reins over the city, make sure you visit it on your next Malaga holiday. The Alcazaba, Malaga’s castle has been built on tests of a roman fortress and was expanded and completed in the 14th century by the Nasrides. The castle is mostly destroyed but with the ruins two museums are located. The archeological museum shows findings from the gotic and greek centuries and the Museo de la Ceramica displays mostly pottery. Within the castle you will find rests of the old Malagan roman theatre from the 1st century. Whether spending your holiday at a long sightseeing trip or play one of the many golf courses around Malaga, the city has a lot to offer. Well known amongst tourists and travelers around europe for the Malaga airport, it one of the largest destinations especially for cheap flights to and from Spain. Especially during summer times thousands of students from around the world come to the university and attend a language course. 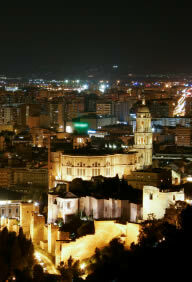 With additionally many private language schools around Malaga is perfect to learn spanish. Many foreigners bought properties or rent apartments along the towns and villages around Malaga. The thousands of villas along the Costa del Sol, show the enormous boom the region had over the past twenty years.